S. V. Talcott, Genealogical Notes of New York and New England Families, , at https://books.google.com/books?id=6YehIsw-eF8C . Albany: (1883) , p. 570. Peter Boylston was born about 1673. Peter died on September 10, 1743 in Brookline, Massachusetts. 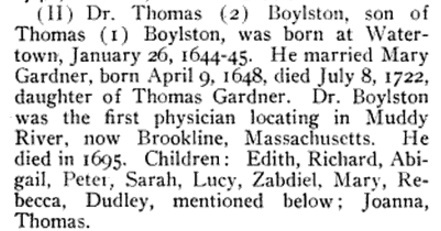 Thomas Boylston was born perhaps about 1678. "New Hampshire Death Records, 1654-1947," database with images, FamilySearch (https://familysearch.org/ark:/61903/1:1:FSNJ-NNL : 12 December 2014), Fred W. Boynton, 04 Feb 1919; citing Concord, , New Hampshire, Bureau Vital Records and Health Statistics, Concord; FHL microfilm 2,026,163. "New Hampshire Death Records, 1654-1947," database with images, FamilySearch (https://familysearch.org/ark:/61903/1:1:FSLV-8F9 : 12 December 2014), Lydia Woodbury, 13 Mar 1883; citing Thornton, Bureau Vital Records and Health Statistics, Concord; FHL microfilm 1,001,116. Record added: Feb 28, 2010. James Savage, A Genealogical Dictionary or The first Settlers of New England showing Three Generations or Those who came Before May, 1692 on the Basis of Farmer's Register, (1862) , vol. 1, p. 228. James Savage, A Genealogical Dictionary or The first Settlers of New England showing Three Generations or Those who came Before May, 1692 on the Basis of Farmer's Register, (1862) , vol. 2, p. 191. The bi-centennial book of Malden, , at https://books.google.com/books?id=s0wIAAAAQAAJ . Boston: Geo. C. Rand & Co., (1850) , p. 239.